Lock in a great price for NARA Visitor Center and Inn – rated 9.4 by recent guests! We booked this hotel last minute and it worked perfectly for our family of 4. 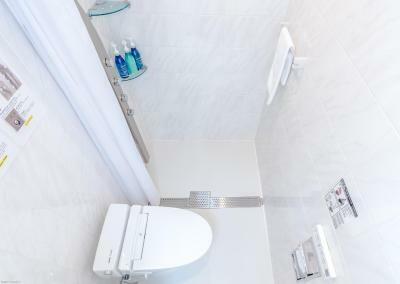 It’s not luxury but simple, clean and affordable. It’s a bit of a walk from train station but you are close to the temples and park. 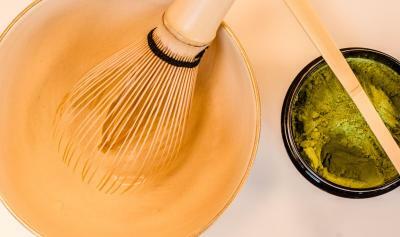 A convenience store is downstairs and they give you green tea at check in. You can easily walk to restaurants and shops. The staff was so kind and they have craft activities for guests. I recommend for families and budget travelers. It was comfortable and clean. This isn't a 4 star hotel, you are sleeping on traditional tatami (sp?) 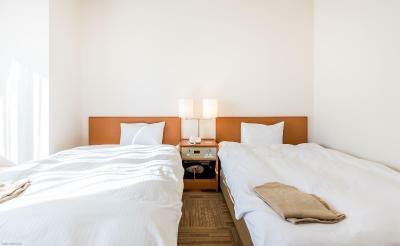 mats and the room is traditional (aside from modern bathroom), but it is excellent if you are looking for a traditional experience with modern amenities. 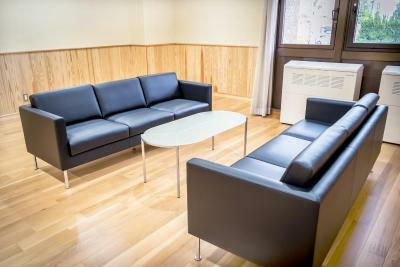 It is very clean, the staff is lovely and helpful, the location is amazing - easy walk from train station, which takes you right down the main road, and easy walk to parks, gardens, museums, sake breweries, tea ceremony place, etc. Convenience store on bottom level was handy. 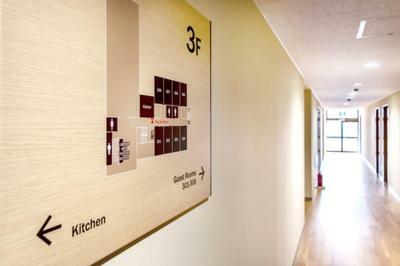 Friendly staff who are very knowledgeable about the area and genuinely care about your stay. 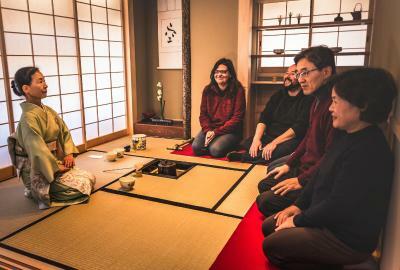 Great ryokan experience. 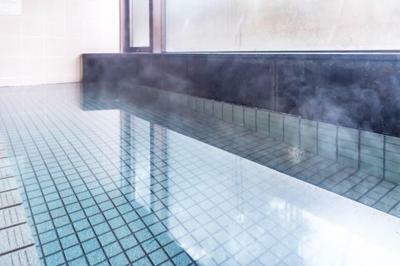 The Onsen is open late. It is government owned so it is polished. Located in the visitor center so very helpful. Got great restaurant recommendations. Very nice area close to markets, historic Naramachi area and Todai-ji temple/Golden Buddha, 5 story pagoda, Kofuku-ji National Treasure Museum. Excellent value for the money. The staff were incredibly attentive, & were committed to addressing all our needs. I made this almost as a previous day reservation but had no regrets at all! The hotel is very nice and I feel it's a very good price/quality ratio. Everything in the room was perfect. Staff was super friendly, and even one of them was super excited because he heard I was from Costa Rica, and he would have the chance of practicing his spanish! I didn't have the chance of going to the bathhouse, so I can't comment on that. But lucky, the hotel provided a "Handy" smartphone. Great location, great view from the room, very large room. The staff was genuinely nice and helpful, the room was extremely comfortable, the location fabulous! Very good location with a view of the 5 story Pagoda. Neighbourhood is very quiet. My husband and son enjoyed the coffee vendo on ground floor. 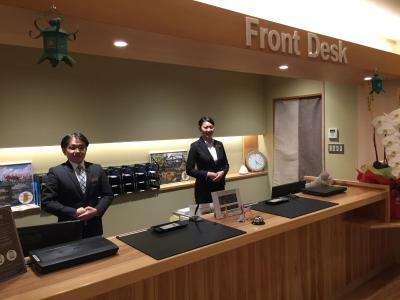 NARA Visitor Center and Inn This rating is a reflection of how the property compares to the industry standard when it comes to price, facilities and services available. It's based on a self-evaluation by the property. Use this rating to help choose your stay! 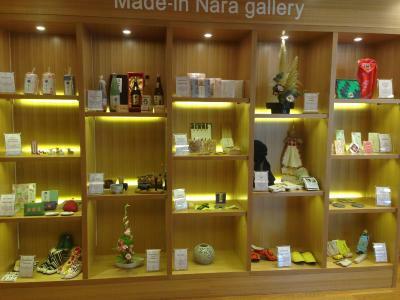 The Nara Visitor Center and Inn is located in the heart of Nara, just a 3-minute walk from Kofuku-ji Temple and Naramachi. The Todai-ji Temple and Deer Park are a 10-minute stroll away, while Nara Station on the Kintetsu Line is a 7-minute walk. JR Nara Station is 14-minutes away on foot. 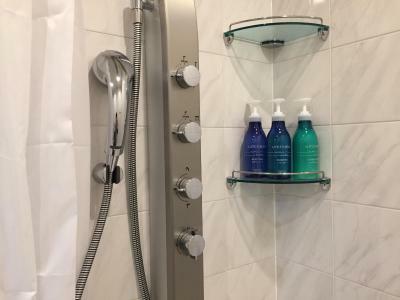 All guest rooms feature air conditioning and heating, and are equipped with a fridge and flat-screen TV. Japanese samue nightwear are available to all staying guests. 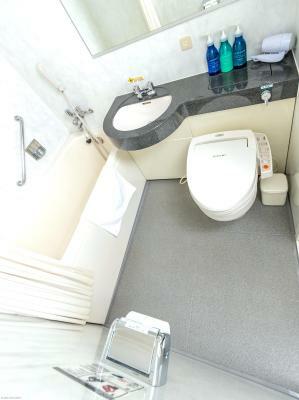 Some units come equipped with an private bathroom with a shower, while some Japanese-style rooms come with an en suite shower. 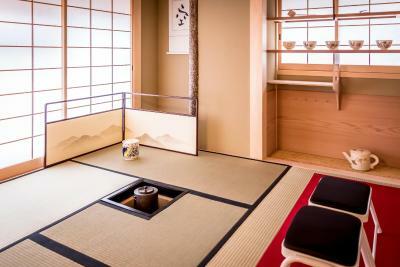 Japanese-style rooms feature tatami (woven-straw) floors and Japanese futon bedding. The property offers free WiFi access and a 24-hour front desk. Luggage storage is available. 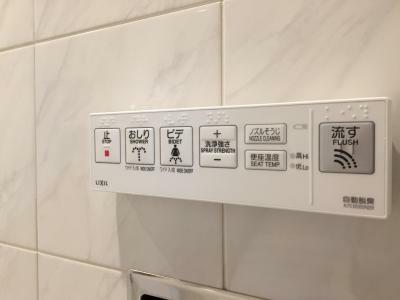 There is a public bath on site, where guests will find free toiletries and hairdryers. 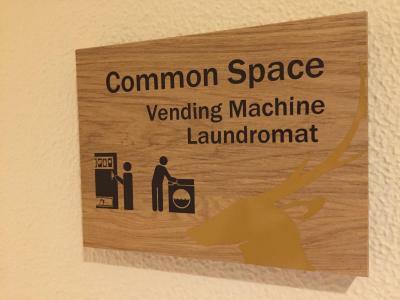 A coin launderette, a shared kitchen and free-use internet PCs are offered on site. 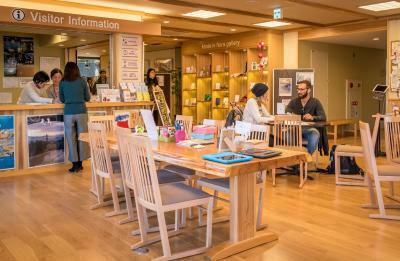 The on-site tourist information desk offers information in English, Chinese and Korean. 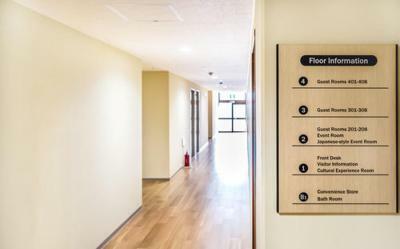 Services offered at the desk include transport and meal tickets at a discount, currency exchange, bike hire at a charge, cultural activities at an additional charge, such as Japanese calligraphy lessons, and tour arrangements. 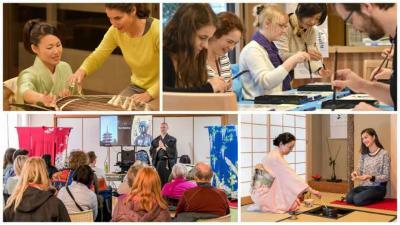 Some cultural activities such as origami folding are offered free of charge. This is our guests' favorite part of Nara, according to independent reviews. 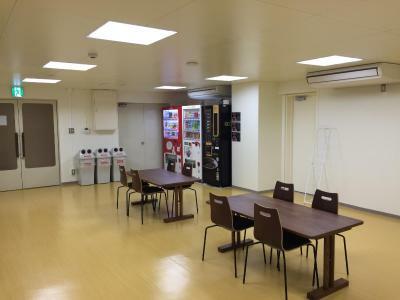 This property also has one of the top-rated locations in Nara! Guests are happier about it compared to other properties in the area. 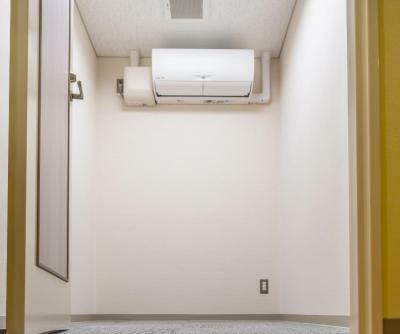 This property is also rated for the best value in Nara! Guests are getting more for their money when compared to other properties in this city. 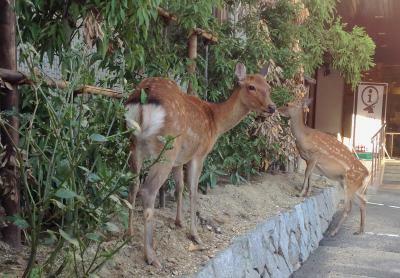 When would you like to stay at NARA Visitor Center and Inn? 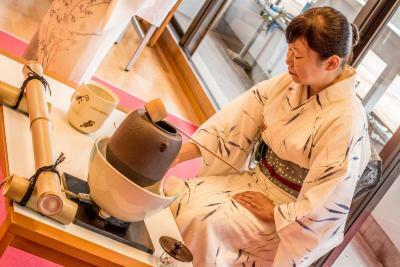 House Rules NARA Visitor Center and Inn takes special requests – add in the next step! NARA Visitor Center and Inn accepts these cards and reserves the right to temporarily hold an amount prior to arrival. Please contact the property directly for more details regarding the cultural activities offered to guests during their stay. Horrible and strange pillows - half buckwheat hulls, half tubular hard foam. They did not have enough of the standard/euro type to go around. They called me at 2 minutes past checkout time, which is 10am. They charge for a 30 minute late checkout. No food on site - not clear on web site (but convenience store right next door). Pajamas are scratchy (like linen), so bring your own! Generous size of room, even by USA standards. 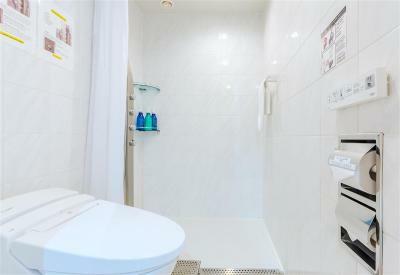 Odd arrangement with sink next to window at opposite end of the room to the bathroom. Expensive for what it was. 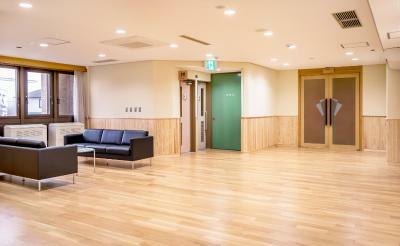 Nice tatami room. Kitchen available if needed (although you had to go to reception to borrow utensils). 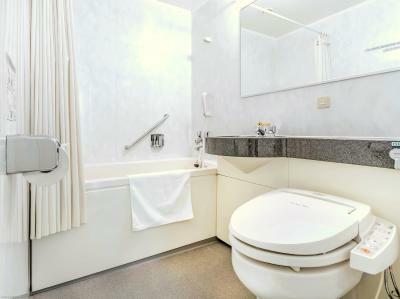 Fantastic location on the edge of the park and opposite Kofukuji temple. It would have been good to have had a breakfast option. The location was great, a short walk to Nara Park and to the station. The origami workshop was very good. The local green tea provided was excellent. I wish there was coffee but everything else was great. 10am checkout. Think should shift to 11am or noon. Sink not in the bathroom. Breakfast is not provided, so if you want an early breakfast before local cafes open you would need to self cater. However I knew this when I booked so this is not a complaint. The staff in the in house information centre are excellent and go well beyond the call of duty. 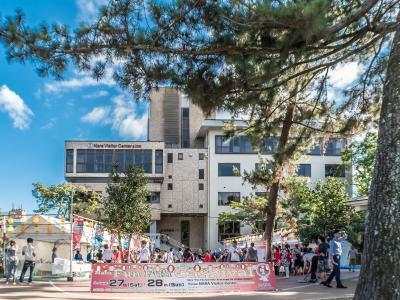 Super location only a few minutes walk from Nara park and the main temples and the old town with it's good restaurants and the very good craft centre. Laundry facilities, washer and dryer, are inexpensive and detergent is provided. Husband wasn't super comfortable on tatami mat, but baths were great and pj's were cute! Kitchenware (disposable) and utensil have to be checked out at the front desk (first floor). 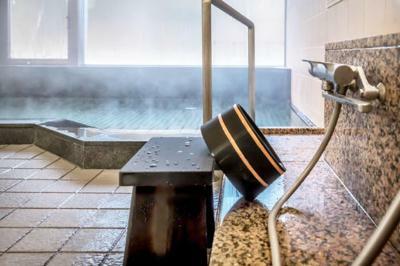 Very nice staff, excellent place with onsen! The only thing we didn't like was the early check out at 10 am. 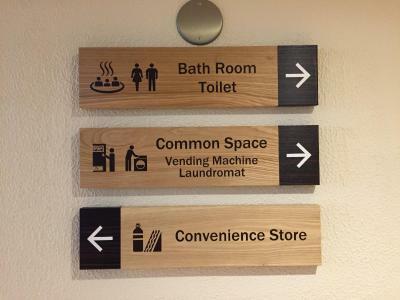 This hotel has everything. 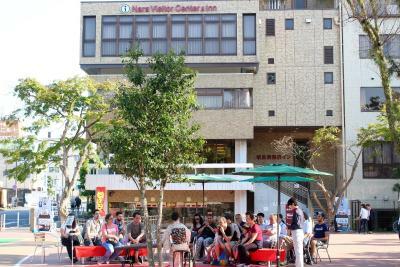 It is centrally located, just a few minutes walk from the train station and Nara park, but still in a calm area. There are many shops and restaurants nearby. In the basement there is a supermarket open from 7 in the morning until late in the evening, which you can access directly from the hotel. In the entrance area of the hotel they have different info material and brochures about Japan, so it's a very convenient stop especially if you are at the beginning of your trip. 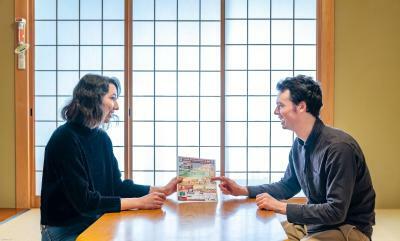 The also have an info folder with restaurants they recommend in Nara (and they will be happy to make a reservation for you). 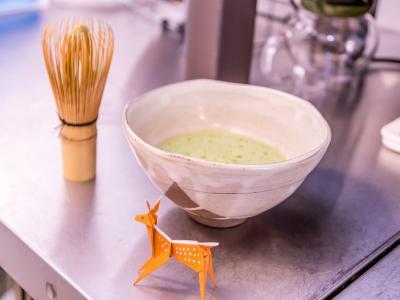 We tried one of the Kaiseki restaurants, which was simply delicious and a truly amazing experience. We stayed in a Japanese room which was huge and had a nice view of the pagoda. It got a bit cold at night, but there is a heating that you could turn on. The staff is super friendly and helpful, and all speak English well. 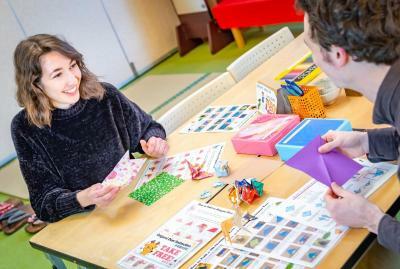 The is a craft room where you can do origami deers or cranes (staff will be happy to assist) or dress up in costumes (e.g. as Samurai or a ninja). 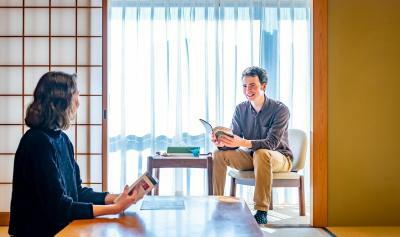 And if you have a little bit more time, they will show you how to write your name in Japanese and the meaning it has. 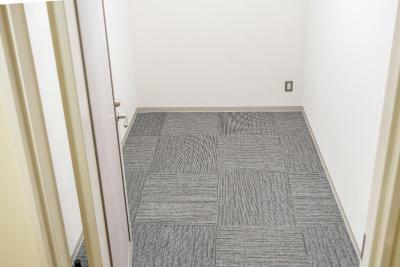 The overall clean room had a few corners which were not so carefully cleaned, such as the edge of the carpet area, or the top of the furniture. 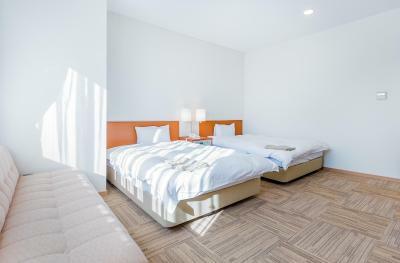 Central location, japanese style bedroom with tatami and air conditioning. Very friendly staff and interesting information in the visitor center. Kitchen and public baths. The back entrance with stairs is probably most people find at first. Better put a sign there for people looking for elevators (the in-store entrance) or slope (main entrance). It looks like there are plenty of free activities in the visitor center. Though we didn't have time for any of that, we did have a pleasant chat with the very friendly staff. A bit far from Kintetsu Nara Station, especially if you are with luggage.